We’ve just released three new plugins that we think you’ll like and which, for many of us, might be a useful alternative to BuddyPress. You see, we love BuddyPress, it’s really cool, but at the same time it basically *takes over* your WPMU site and not all of us want that, do we? Also, BuddyPress doesn’t do some things that we’d like it to do – for example there are no wiki features. 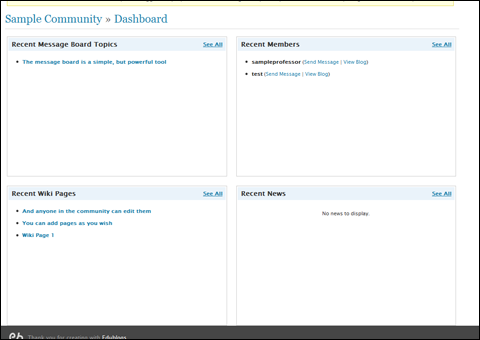 Anyone can create a community via the ‘Communities’ tab, then they can contribute to that communities message board, wiki or news areas or visit that communities dashboard. Under the above tab users will have the opportunity to read their messages, send new messages, review sent messages, export their messages or turn on and off notification (by email) of messages. And, needless to say, these are first releases which I’m sure we’ll be able to enhance in the future, so let us know how you like them and how you’d like to see them improved.